Great value! Easy parking, close to Munich. Modern hotel. Are you trying to figure out the difference between a resort and a villa? If you haven't stayed in a villa before, then you are missing out on the ultimate peaceful getaway in Dachau. When you choose to stay in a private villa that accommodates everyone, you won't have to share a crowded pool with hundreds of strangers or wait in line to get a drink at the bar. Expedia is here to help you make the most of your getaway, so go on, make yourself at home. Wouldn't it be more relaxing to sip a drink poolside, or sprawl across a large comfy couch anywhere you want? Whether it's skinny-dipping at midnight or scarfing down breakfast for dinner, this is your house, so you make up the rules. And yes, we know you still need your space from time to time. Which is why our villas are so much bigger than your typical run-of-the-mill hotel suite. When you are on vacation, the last thing you should worry about is getting separated at a resort, or having to cancel your "fun in the sun" day because the pool is too packed. 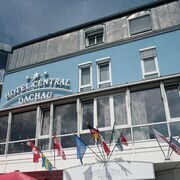 Expedia can help you make the most out of your visit to Dachau without having to hurry to make reservations at an on-site bistro or at the poolside lounge chairs. Our beautiful villas will leave you feeling like you actually went on vacation, rather than a cramped stay at a resort with your whole family. Staying in one of our unique properties is the perfect way for you and your family to enjoy a laid-back getaway. Just think: You can do just about anything you want on a villa property. Isn't that the life? This time on your Dachau holiday, ditch the noisy resorts and cramped suites and relax at your own private villa. They'll give you more space and privacy, so you can leave and arrive as often as you want. You will have plenty of space and time to make new memories and catch up with your loved ones once you have some alone time, all while enjoying the comforts of a luxury villa. From floating in the pool to baking in the kitchen, you will be shocked to find out that the opportunities are limitless once you step inside your Dachau villa. What are you waiting for? Book today and save big-time on one of our holiday villas.